The Internet of Things (IoT) presents an opportunity to collect real-time information about every physical operation of a business. From the temperature of equipment to the performance of a fleet of wind turbines, IoT sensors can deliver this information in real time. There is tremendous opportunity for those businesses that can convert raw IoT data into business insights, and the key to doing so lies within effective data analytics. 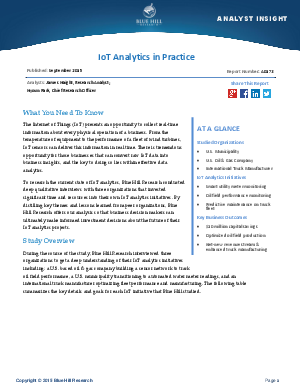 To research the current state of IoT analytics, Blue Hill Research conducted deep qualitative interviews with three organizations that invested significant time and resources into their own IoT analytics initiatives. By distilling key themes and lessons learned from peer organizations, Blue Hill Research offers our analysis so that business decision makers can ultimately make informed investment decisions about the future of their IoT analytics projects.